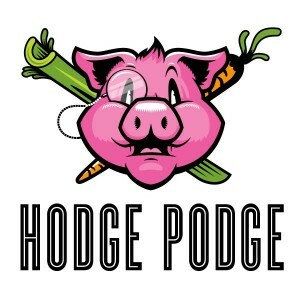 Hodge Podge Truck – Cleveland, OH (@hodgepodgetruck) – Food Truck Talk – Searching for the best foodtrucks! 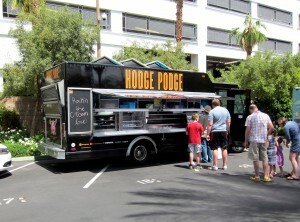 It’s has been a few months since the Hodge Podge Truck launched. The truck’s first public appearances was as a contestant in the Food Network’s Great Food Truck Race. 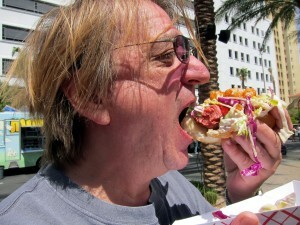 Tune in tonight (August 14, 2011) to see the first episode of this season’s Great Food Truck Race. 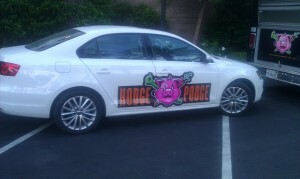 Good luck to the Hodge Podge truck and all of the other contestants! Today is the first day for Cleveland’s newest food truck – in Las Vegas. Chef Chris Hodgon of Dim and Den Sum fame (@dimanddensum) has launched his second food truck as part of a food truck extravaganza in Las Vegas (we believe as part of the Food Network’s Great Food Truck Race). Details are sketchy about the trucks involved in this seasons episodes so it is unclear when the Hodge Podge Truck will make it’s first Cleveland appearance. 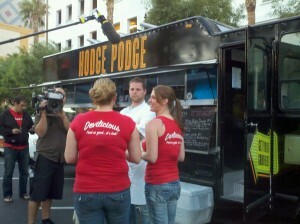 Former Clevelander and current Las Vegas food blogger Kathy of .lasvegasfoodadventures.com reports that business was extremely brisk at the Hodge Podge Truck with Chef Hodgson and his team “working their tails off.” Thanks to Kathy for the first known photos of the new Hodge Podge Food Truck! Note that the chalboard sign says “Rockin’ The C-Town Love.” Us Clevelanders are a proud lot! Chef Hodgson clearly has great culinatry skills but is also very active in supporting Cleveland as well as several area charities. It’s the Hodge Podge Hot Dog! Food truck fanatic Michelle from http://www.lookingforfoodtrucks.com also stopped by the Hodge Podge Truck and sent along some more photos! 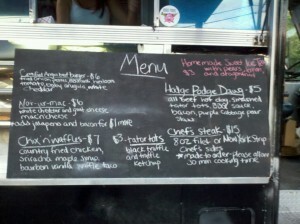 Here is todays menu, it includes Chef Hodges legendary Tater Tots. 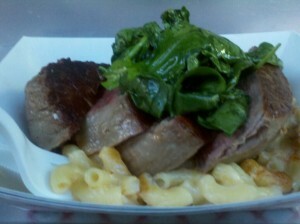 It seems the menu has a lot of comfort food items including the Chef’s Steak (Filet) with some mac n cheese goodness. Chef Hodge takes a break to chat with the lovely ladies from San Diego’s Devilicious Food Truck, one of whom is also from Ohio! (@deviliciousfood). 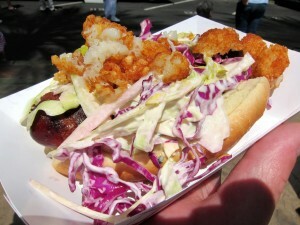 Another great photo of the Hodge Podge Dog (all beef hot dog, seasoned tater tots, bbq sauce, bacon and purple cabbage slaw). Here’s a photo that should look familiar to Clevelanders who have visited Dim and Dem Sum – it’s Chef Hodgson having a good time! The Hodge Podge team has been working day and night getting this new truck ready for action. Congrats and best wishes to all involved with the Hodge Podge food truck! 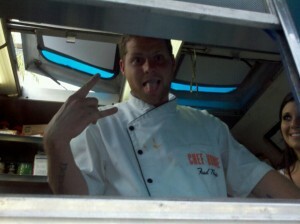 During his cross country adventure will Chef Hodge be serving food from the mini-me Hodge Podge mobile as well? 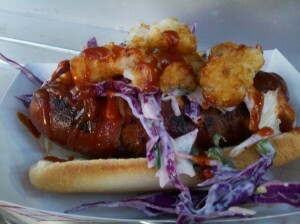 Photo courtesy of food truck fan http://www.twitter.com/mitzula!